A derelict building is something best left alone. We leave them where they are, without ever even wondering at what might be inside. In Homesick, we take a step into one such building and see and feel the personal stories of its previous tenants, perhaps finding more than just scattered memories. A game of human stories. With a game like Lucky Pause’ Homesick, I’ll get the ONE bad thing out-of-the-way: It’s short. It’s astoundingly short. You can finish it in one or two hours. But those two hours will be an emotional journey with very few equals. There aren’t any clear explanations as to who the protagonist is, though I have my own theories. Sadly, if I were to share even one of them, I’d ruin the entire experience for you. His story you see all around you, or perhaps I’m reading more into it than I should. But beyond his story and even beyond the origins of this dilapidated building, a survivor of an environmental disaster, what Homesick gives you are deeply personal stories, of joy and heartache, devotion and responsibility, life and death, of the building’s previous tenants. 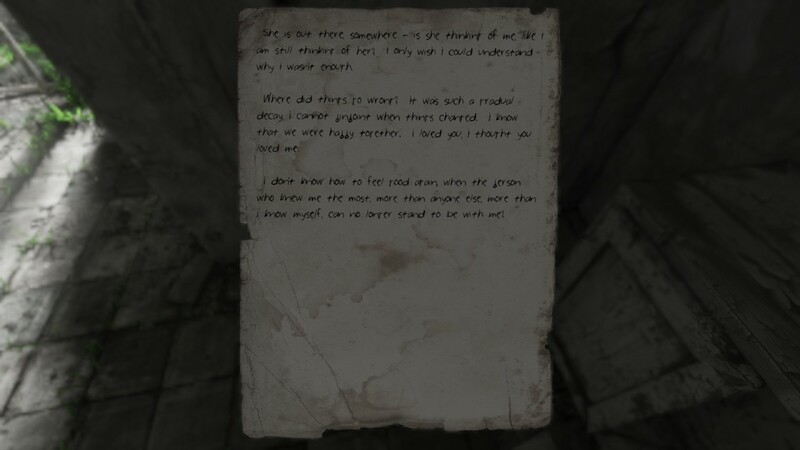 At first you can’t read any of them, as he text appears scrambled, but near the end of the game you’ll unlock them fully and be able to comprehend what the environment was already trying to tell you. There is beauty in this desolate place, a peaceful sadness. The gameplay is simple. During the day, you pick up a short selection of items and use them on the environment. The one you need most is the bucket, as you’ll need to collect water for the flowers to trigger the next sequence. Each day sequence precedes a night one. During the night you carry an axe and must run from dark tendrils emerging from the floor. Linger too much in an area and they’ll grab you, but as they do, you won’t hear monstrous roars but echoes of past tenants and a child’s innocent laughter. The purpose of each night phase is to open a path to the next area, usually by hacking open a door. There isn’t much interaction between the night and day phases, except for Light. There are switches all around and if they’re not on, then at night that hallway will be impossible to cross. The character can’t push through the darkness in this nightmare world, just as he can’t push through brightly lit passages during the day. The character is extremely photosensitive, and the sun’s rays shining through a French window become a solid wall. The building you play through is in shambles, but it’s highly detailed and visually stunning, which I consider a feat. To make an all-grey sequence of corridors and rooms hook and reel you in. There are dust motes floating in the air, shafts of light streaming through the windows, water falling in droplets from a leak in the ceiling. There are beds, rusted and broken beyond repair, but still in their original place, as if waiting for their occupants to return. To their side you’ll often find bookcases, the tomes inviting you to read them, to discover the truth about the world and more about the people. There are fragments of your story as well, if you look hard enough. Homesick’s visuals are astounding but without the music, they would never have been so effective. The pieces you hear in the game are sad, melancholic, at first just strokes on a piano, a melody of long forgotten memories, of things lost, never to return. Once the violin kicks in, accompanying the piano, it’s like echoes of those memories coming back, the sadness but also the joy of remembrance. I know this because Homesick made me cry. Not about its story or that of its characters, but because its premise, its theme and the visuals and music, together, made me remember all the people and all the things I’ve lost in the past years. I saw and heard my father in every note of the violin, I saw friendships lost in every stroke of the piano, I saw people once close to me, now gone, in every puzzle, in every new room explored and studied. Homesick took me through a journey of my past, of the things I loved that are gone forever and I am still in awe of this. 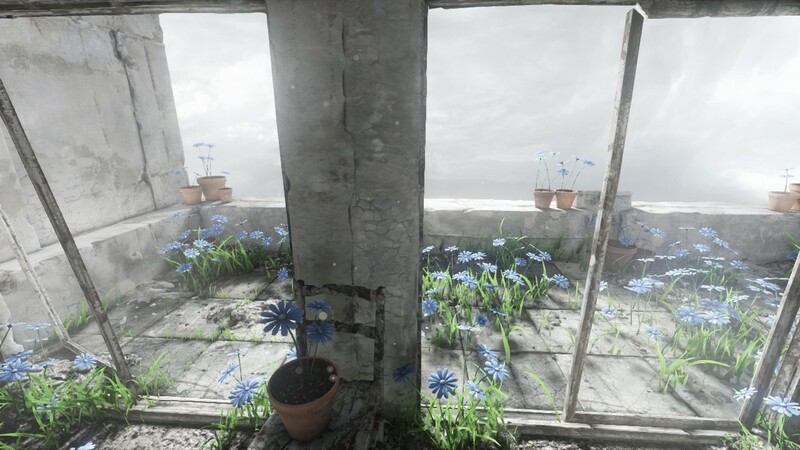 I’ve shed tears at beautiful stories, but never before had a game made me feel like this about my own story, made me feel things I had long since closed off, barricaded in some corner of my mind, my Attic, so they wouldn’t hurt me anymore. Broken and shattered and it looks gorgeous. I know some of these residents, they were good people. I wonder where they are. An abandoned room brings so much to mind. Still a loving home, even if empty. Homesick is an amazing journey of a game. It’s short, yes, but it can take you on an emotional ride you need to experience. I can only tell you from my experience: It made me cry. Next Post The Weekly Puzzle – I’m Batman!